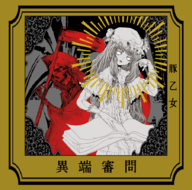 The Inquisition (異端審問, Itan Shinmon) is a doujin album by BUTAOTOME released on 2013-10-13 (Touhou Kouroumu 9). It features vocal arrangements of themes from Phantasmagoria of Dim.Dream, Lotus Land Story, Mystic Square, Embodiment of Scarlet Devil, Perfect Cherry Blossom and Shuusou Gyoku. This page was last edited on 21 December 2016, at 21:08.